Your Office Stop is your source for advanced graphing calculators. Many standardized tests, advanced placement classes, and college entrance exams permit, or even require, the use of a graphing calculator. From the TI-73 Explorer, made for 6th through 8th grades, to the more advanced high school and college models, we carry a nice range of graphing calculators, for all your needs. 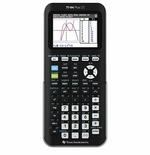 Our graphing calculators are perfect for students interested in taking the PSAT, SAT, and ACT college entrance exams, as well as those involved in AP classes and the International Baccalaureate (IB) program.